One of the news which definitely left a mark on the 2018 season was the departure of the Swiss-based bike manufacturer BMC as the main sponsor of the BMC Racing Team. A team with a license held by Continuum Sports based in California, USA, yet very much rooted in Europe staff-wise. After a few months of hard work, roughly in mid-2018, the BMC Racing Team’s general manager Jim Ochowicz found its ‘white knight’ in the Polish Multinational CCC. It’s a company focused on Central and Eastern Europe, selling shoes, handbags and other accessories to a substantial customer base in Italy, Germany, and a number of other countries. It’s worth mentioning that the founder and chairman of CCC is a Polish businessman and an avid cycling amateur who participated in and won races at various levels when he was younger, hence his previous constant support and love for the sport via the CCC Sprandi-Polkowice and now at the World Tour level with the CCC Team. 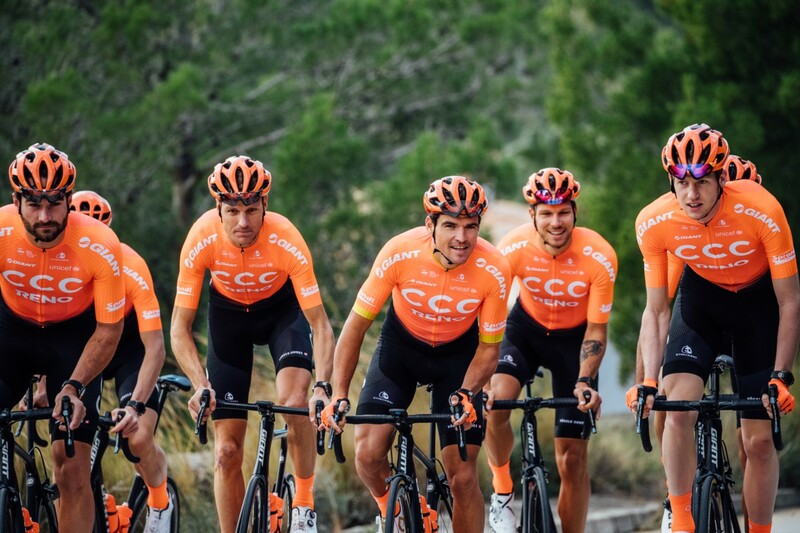 The CCC Team will be centred around the Belgian champion Greg Van Avermaet but will also include top riders such as Alessandro De Marchi (BMC Racing Team), Simon Geschke, Laurens ten Dam (both ex-Sunweb riders), and a former Team Sky member Łukasz Wiśniowski from Poland. 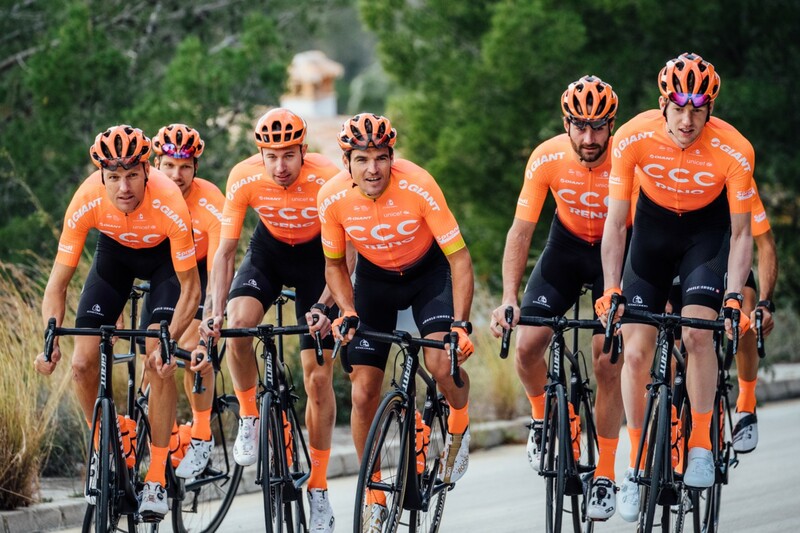 So it is clear that the CCC Team is not a former Pro-Continental team moving up per se but rather the continuation of the Continuum Sports-owned team with some riders and staff making the move from CCC Sprandi-Polkowice. 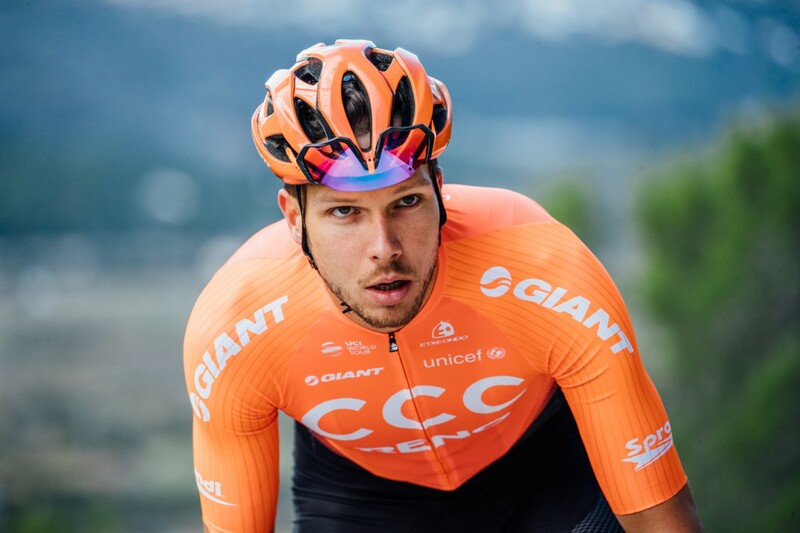 For today’s interview, we reached out to Polish rider Pawel Bernas, who used to be a part of the Pro-Continental’s CCC Sprandi-Polkowice roster of riders, and who currently resides within the 2019 line-up. We discussed his views on the new team, the transition from the Pro-Continental level to the World Tour level, and the upcoming 2019 season. Congratulations on signing a contract with the CCC Team and thus moving up to the World Tour level. You had your inauguration camp in Denia (Spain) in mid-December. With new teammates, new support staff and management, all must have been quite exciting. Well, right away I can say that it was super exciting, even overwhelming at the beginning, because of so many new faces, so many new people, so many names to remember. In fact, we needed stickers with our name, surname, and who we are (rider, management, staff, etc.). I think I had to say “Hi!” like 80 times just the first day. I think that even the riders and management from the BMC Racing Team had an extra level of motivation and felt some extra good vibes and a new positive energy. After Denia, I took an 8-day break to visit my family in Poland and on the 26th of December I came back to my residence here in Mallorca because this is where I prefer to stay during the winter. I’m staying here until the 13th of January. Then I will go back to Poland for one week for a quick holiday. After that, on the 26th of January we all start our second training camp in Denia, Spain. Currently, some of the boys are already training there since it is where a lot of the Belgian riders are training. Tell us about the training camp in Denia prior to the start of the Spring Classics. For sure, it will essentially be a continuation of what I am doing right now by myself here in Mallorca. But when I’m with the guys, there will be a bit harder blocs of training for sure. It seems funny to say but it is easier to do hard training with the team because we have all of the support staff around us like the soigneurs, masseurs, etc., so we really get to focus on riding and nothing else. So I’m guessing that we will be doing around eight really hard training sessions. I also look forward to do something with my TT bike because I did not have the chance yet, so I really want to find a good position on it. The rest will be like all normal training camps; hard training, good recovery, and a great atmosphere team-wise! You now have migrated from a very successful Pro-Continental team (CCC Sprandi-Polkowice) to the CCC Team competing at the World Tour level. How different is the support staff from the Pro-Continental level? The main difference is in the number of people around you because of the obvious much larger budgets available to a World Tour team compared to a Pro-Continental team. This means that they can hire a lot more people to help us. You see, I’m feeling that it is not so much of a change in quality but rather in quantity. There are just so many more people on this new team. For example, we had one physiotherapist at CCC Sprandi-Polkowice last year (who was doing a great job) but now we have three. And this is only the physiotherapists, I am not counting the masseurs, soigneurs, etc. So the support staff can really work at a more individual level so as a rider, you have the opportunity to have much more time from the staff. In retrospect, I would say that my former Pro-Continental team was well-organized and structured. I also appreciate that this team, which is based on the previous BMC Racing Team, seems to be really open-minded. You know, this team was a legend, with so many great results and a very well established system. But at the same time, they are not stuck inside a mould telling us “this is how it should be done” so I think that it is a good thing that their staff is mixing up with some of the old CCC. It is a well-known fact that the BMC Racing Team was consistently extremely strong in time trials. Do you think that this will remain in focus for the team this year or is there going to be some kind of shift? Well you know, the new team benefits from all of the past ‘Team Time Trial Protocols’ already developed so, for us the new guys, we just need to get along on the new TT bikes and find our new positions on these bikes. But as you know, the CCC Sprandi-Polkowice also had a very strong time trial squad back then – it has just added a few guys who came from other teams now. So, if you ask me, I think that we can still do a very good job on that front! Whether we will be as good as the BMC Racing Team I cannot say since they were at the top but, generally speaking, it is not as if we are saying “it’s in the past and now it’s over”. And you know, I must say that the people from the BMC Racing Team are amazing all in all. When I am sitting with them at the dinner table and they are talking about things like, “You remember this race with Cadel Evans” or so and so and I just sit there thinking, “I was watching this on TV and they were there!” So you see for me, it is easy to adapt to such amazing people! Let’s talk about equipment a little bit. Changing teams is something which involves adapting to different things, processes, people, etc. We talked about the support staff earlier but there is also the multitude of new tech and equipment which you also must get familiar with. Do you see major differences here? You can always feel a difference, for sure! But at the same time, if we talk about the bike for example, we all know that Giant is a well-known, high-quality company that has been making bikes since the early 1970s. So yes, I can feel that they know what they are doing when it comes to supporting a World Tour team. For example, I have already noticed how much support and experience they can provide to the team. Not that we did not have it with our bike sponsor at the Pro-Continental level, but it is just that they have been working with pro cycling teams for about 25 years already. I have experienced that already when talking with their staff, the level of attention to details they have is amazing. Again, it is also a question of the number of people dedicated to the goal. In regards to the bike and bike geometry, I must say that it was quite easy to switch from my previous Italian Guerciotti bike, which I used at the Pro-Continental level, to the new Giant. Essentially, we had to work on slightly increasing the level of my saddle because we work on making my position more aggressive each year, which is linked to working on my back muscles. However, I must say that the bike feels really good to ride. I find it very responsive but not ‘nervous’, which is important. It is stiff and fast but, at the same time, in tight corners you do not lack control because it does not get too shaky like some other bikes can. The 2019 calendar for the CCC Team is ‘filled-to-the-grills’ with amazing races starting with the team leader’s (Greg Van Avermaet) personal affection for the Spring Classics with races such as Omloop Het Nieuwsblad and Kuurne-Brussel-Kuurne in Belgium, followed by Strade Bianche in Italy. Next will be the Tirreno-Adriatico in Italy. Following will be the Tour of Flanders and the mighty Paris-Roubaix. Let’s look at this year’s calendar and what is in store for you. 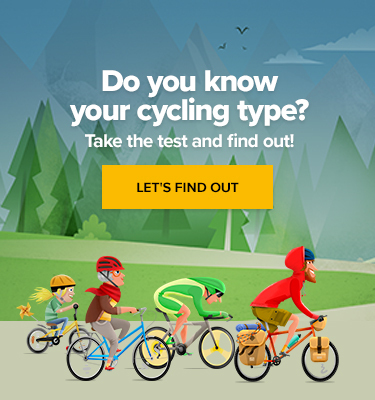 Has your 2019 season already been defined in terms of the races in which you will take part? I will start my season in Spain at the Vuelta a Murcia on the 16th of February. Then I will do Vuelta al Meria. After that I will move to Portugal for the Volta ao Algarve from February the 20th to the 24th. Then it will be time for the mighty Spring Classics! I am really excited about that because it is my main focus for the beginning of this year’s season. This means that I must be in top shape for late March and the beginning of April because it is when the most important Classics races are. My first Classic race will be Kuurne–Brussels–Kuurne in Belgium on the 3rd of March. Then I should have Paris-Nice between 10th and 17th March and after that starts the normal bloc of Classics – we will see where they will send me. Essentially, the management tells us, “the Classics Guys”, to just be ready for that time period and then they decide who goes where. They can always switch us from one race to another. I just hope that they will use my best shape as much as possible! Following that I will have some time off. In May I should also do some stage races and then we will see how it goes. What about the Grand Tours? Of course, they are all still a long way ahead but do you see yourself as part of the team for one or more of them? In which would you like to be and why? As of yet, this has not been planned. Of course, my dream is to ride the Tour de France as it is the dream of every cyclists. It is a goal I would like to achieve in the upcoming years, not necessarily this year. This year I would just be happy to participate in one of the three Grand Tours and show the team that even if I come from the Pro-Continental level and am now at the World Tour level, I am ready to take on such a challenge. Look, I don’t know, maybe this year it could be La Vuelta? I will do my best to be selected for La Vuelta 2019 because I have said from the beginning that being part of any Grand Tour this year is my goal, so all I have to do is make the team want me for it! We all know that the CCC Team will require a lot of adaptation in 2019 and your general manager Mr. Jim Ochowicz has stated an overall goal of 20 wins for this year – all races included. So our question to you as a rouleur is this: How do you personally see the team in the next two to three years? Has the team already put down specific long-term goals? It is a good question. At the top level, the management and the sponsors have been discussing this because when a new sponsor comes to the table it is not a one-year project. And they can talk among them but to be honest, at my level what we hear is more about the season’s short-term goals because it is the opening year of the team, so us riders must focus on Greg Van Avermaet, stages wins, one-day race wins, and so on.